Here is another gift idea for anyone left on your list. 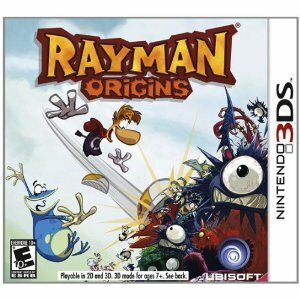 We have been trying out Rayman Origins for DS and we love it. Rayman is such a cool character…. right up there with Mario and Luigi! Ryaman Origins has 60+ levels of madness. Players get to explore a massive world with over 100 characters & 6 unique worlds designed for all ages and playing styles. Rayman Origins is full of crazy moves and gameplay. We enjoyed how Rayman gains unique abilities as he moves through the adventure, including swimming, diving, slapping and the sensational “HairlyCopter. The game also has some epic boss fights like a giant pink monster with hundreds of eyes, a really, really angry bird and an evil carnivorous daisy. Rayman Origins will surely put you to the test with these and many more challenging boss battles! We also loved taking advantage of the Street Pass where you can share your progression, number of collectibles, time played, unlocked achievements, and avatar with others.